Looks like this is the week of Muti and it’s creator Neville. In what I think is a rather big development, because I believe it will grow the number of users considerably, Muti now allows commenting by registered users. 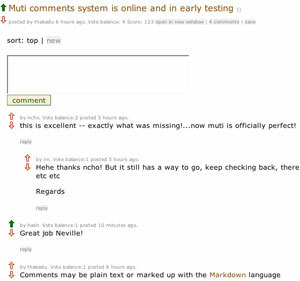 I know Neville was torn on implementation of a comments system on Muti for the past year. This was due primarily because if he allowed comments on Muti, it would likely mean that fewer people would leave comments on people’s individual blogs. This is probably true at a macro level, but at a micro level we find that it isn’t that significant. First, the ability to comment on Muti should see it grow and become an even stronger online entity. Secondly, it’s okay to start conversations on different platforms. Some might be even more open to commenting on a “neutral” field such as Muti, as opposed to someone’s personal blog. From what I’ve seen of this type of thing on Digg and Reddit, I can only think it’s a great feature. Go sign up and give it a try. Once again, “kudus” Neville! I hadn’t thought of that Andre, but that could be useful. It would make Muti much more of a nucleus for conversations, that’s for sure. You’re absolutely right that the trackback spam could become a real issue though. Let’s see what Neville thinks about it. Thanks for your comments and suggestions guys. I will definitely look into pingbacks/trackbacks. The other thing I was considering is having an option on the submit form, which would allow the submitter to specify a preference for where comments should go. These options would be something like “on muti” and “on authors blog”. If the submitter chose “on authours blog” then they would have to supply a url to the comments section for that item on the target blog. The comments url on muti would then take you to the bloggers site, and also display the number of comments from the site. Obviously this option would only be relevant for blog item submissions.